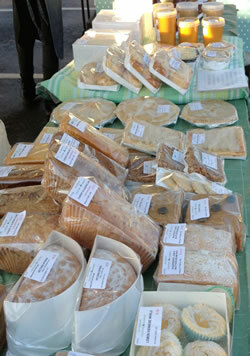 Keynsham Country Market produces homemade bakes, savouries, preserves, local honey and plants in season. 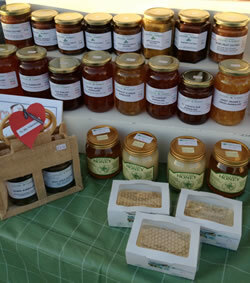 Part of a country wide group of small producer co-operatives, dedicated to producing local, homemade, home-grown products – delicious bakes ‘n’ savouries, a wide variety of jams, marmalade and chutneys, really local honey and plants in the growing season. Everything is grown and produced by our members within the local area using the finest ingredients sourced from our own gardens or local suppliers. Our preserves are handmade in small batches using traditional methods and contain no added preservatives. We believe this approach sets our products apart in both quality and superb flavour from factory produced goods. Our gift packs use environmentally-friendly jute bags. We are happy to take orders for collection at our Farmers’ Market stall. If you have a special request, we will do our best to help. You can find us at Keynsham on the second Saturday of each month. This entry was posted in Bread and baked goods, Fruit, Vegetables, Plants and Flowers, Keynsham, Preserves and honey. Bookmark the permalink. Both comments and trackbacks are currently closed.